Lord Sigurd, the son of Lord Vylon, a descendant of Baldo, one of the Twelve Crusaders, is a prince of Chalphy Castle of the Kingdom of Grannvale, the center country in the continent of Jugdral. He initially wields the Steel Sword, then mostly the Silver Sword (given by Arvis on behalf of Prince Kurth in the Prologue chapter), and later the Tyrfing, which he used in Chapter 5 of Fire Emblem: Seisen no Keifu. Ethlyn is his younger sister. Quan is his brother-in-law and best friend, and Ethlyn's husband. His son Seliph takes over in Chapter 6 of the game, finishing what he started. According to the end of Chapter 6, Sigurd was well loved by many people of the Jugdral continent. Oifey calls him a "kindhearted man" when he rescued Shanan at Genoa Castle in Chapter 1. Mananan, the father of Prince Shanan of the Kingdom of Isaac, often looked to Sigurd's father Vylon for advice. Since Chapter 3, Sigurd was accused of treason against Grannvale by his own country. Before the onset of Fire Emblem: Seisen no Keifu, Sigurd attended the Royal Academy of Belhalla alongside his best friends Quan and Nordion of Agustria's Eldigan. Quan later married Sigurd's sister Ethlyn. In the Prologue, Sigurd heard the news that most of Grannvale's army, including most of Chalphy's army, is en route to invade the Kingdom of Isaach, the north easternmost country in Jugdral. He also heard that his childhood friend Adean is captured by Verdane's Prince Gandolf. He was prepared to fight the Verdanian army by himself, but Chalphy's knights Noish and Alec spoke against it, fearing to let him die fighting alone in the battlefield. Arden joined in shortly thereafter. Finally, the 14-year-old Oifey joined Sigurd to be his tactician. Meanwhile, Quan, Ethlyn, and Finn of Leonster heard about Sigurd's skirmish with Verdane. They traveled to Chalphy and joined Sigurd's cause while Sigurd was en route to Jungby. Earlier, Azel joined Sigurd without his paternal half brother Arvis's consent and invited Lex to join. Sigurd fought Dimaggio and conquered Jungby. He begged the injured knight Midayle to rest, but Midayle was determined to rescue Adean, thus joining Sigurd's cause. Arvis walks over to Jungby territory to assess the state of the conflict with Verdane. Azmur ordered him to give Sigurd the Silver Sword. Sigurd is regarded by his citizens as a "kindhearted man," and Azel wishes that Arvis could be more like him. Sigurd and his army fight off Gerrard's army and conquer Evans castle. After Sigurd conquered Evans castle, Filat dubbed him "Holy Knight of Grannvale"; however, Sigurd searched all through Evans castle, but no trace of Adean could be found. Henceforth, he traveled deep into the Verdane, the southwesternmost country of Jugdral. He meets with Eldigan at Evans castle. Meanwhile, Dew snuck around Marpha castle and helped Adean escape the clutches of Gandolf with the help of Jamke. Adean went to speak with Sigurd and Midayle. Then Sigurd and his army faced the Genoa army and saved Shanan from the clutches of Kinbois. Shanan told Sigurd that he was the prince of Isaach and that his paternal aunt Ayra was hostile toward Sigurd and his forces already in his army, since she was from Isaach and most of Sigurd's army including himself was from Grannvale. Sigurd does not care too much about the Isaachian-Granvalian war, nor does he care what country Shanan is from. Then they marched to Marpha, and Midayle took revenge against Gandolf. After the battle of Marpha, Sigurd sees Deirdre for the first time, but Deirdre leaves without telling him her name. Jamke reluctantly goes with Sandima's army and attacks Sigurd. Adean tells Jamke that Sigurd did not come to Verdane to invade. Between the thickets of the spirit forest, Sigurd sees Deirdre once again, and she joins his cause and would use the Silence staff to prevent Sandima from using the Fenrir tome. After Sigurd liberates Verdane from Sandima's control, the dying king Batou tells him about the Lopto sect, the organization behind the evil lurking across Jugdral. When he learned that his friend Eldigan was being held prisoner by his own King Chagall, Sigurd opted to rescue him along with Eldigan's sister Raquesis. He was also joined by a bard named Lewyn (who was in fact the Prince of Silesse, as informed by the Pegasus Knight Ferry, who joined later), a dancer named Sylvia and two mercenaries, Holyn and Beowolf, taking control of Agustria on the way. 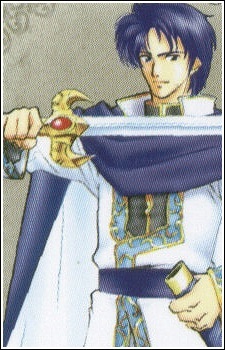 He worked to restore peace for months, during which Deirdre gave birth to his son Seliph. But Chagall later attempted to attack again. Sigurd intercepted, later hearing bad news from Father Claud about his family being blamed for the death of Prince Kurth, as well as having to nearly fight Eldigan to the death before learning of his death via execution by Chagall; after that Deirdre soon went missing. Afterwards, he rescued Briggid from the Orgahill Pirates as well as rendezvousing with Claud while assisting the young princess of Freege, Tailto; however, Sigurd soon found himself surrounded by the Empire's army. He fled to Silesse and was caught in the civil war, ending it and gained the trust of the Silessian people. On his way back to Grannvale, he met his father, Vylon, in his dying breath. He gave Sigurd the Holy Tyrfing, then broken. Repairing it as quickly as he could, he sprung back into action and defeated Langbart (Lex's father). He sent Oifey and Shanan away with Seliph, worried about their safety. While crossing the Yied Desert, Sigurd was attacked by the Wyvern Knights of Thracia. It was after conquering the next castle that Sigurd learned that the Wyvern Knights, led by Travant, had ambushed and killed Quan and Ethlyn. On his way to Velthomer, he faced Reptor (Tailto's father); however, during the course of the battle Arvis turned his back on Reptor and cooperated with Sigurd to destroy Reptor under the command of Aida. Sigurd, however, was unaware to know that it was his turn to be destroyed next. "I hereby sentence you to death for your acts of treason. No visits to the king today, Sigurd." - Arvis to Sigurd, during the prelude to the Battle of Belhalla. After he conquered Velthomer castle, Sigurd and his army were guided by Aida towards the Granvalle Capital, Belhalla for a celebration in their honor. Arvis and his mage unit greeted the battle worn army before Belhalla Castle only to quickly turn on them. Sigurd was taunted repeatedly by Arvis shortly before Arvis revealed his new wife to be the missing Deirdre. After a sad, brief reunion with Deirdre (who lost her memories of Sigurd, but briefly recognized him before being taken away), he was executed by Arvis with the Holy Valflame tome, despite how Arvis was ultimately being manipulated by Manfroy, the head of the Lopto Sect. As time passed, the man formerly known as a traitor to his homeland was later revered as a legendary hero. 15 years later, his death was avenged by his son Seliph.